A bright and healthy smile can boost confidence and increase self-esteem. 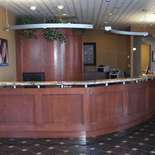 At Accent Orthodontics, we provide orthodontic care in an environment that is comfortable and inviting. Dr. Michael Bleau and his friendly staff are dedicated to providing you with a pleasant visit and a positive orthodontic experience you’ll remember for a lifetime! Contact our Calgary orthodontic office to schedule your initial consultation. We look forward to meeting you and helping you attain a beautiful smile.